2000trees get nostalgic with new additions! 2000trees is our favourite medium sized festival in the UK due to it’s incredible atmosphere and awesome acts. 2019 is looking to be even better than last year! 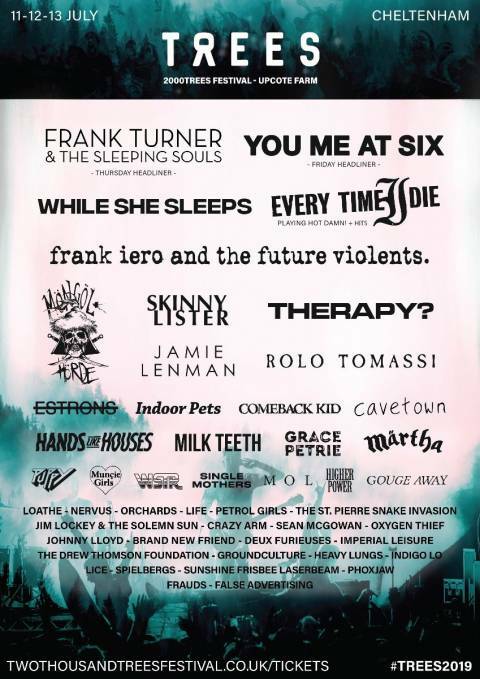 So we already have You Me At Six announced as a headliner for 2019’s 2000trees festival and now we have been graced with the news that festival favourite Frank Turner is back as Thursday headliner with his band The Sleeping Souls! So Camp Turner is going to be one hell of a party camp this year! Also announced alongside Frank are: Möngöl Hörde, Skinny Lister, Rolo Tomassi, WSTR, LIFE, Petrol Girls, The St. Pierre Snake Invasion, Jim Lockey & The Solemn Sun, Crazy Arm, Sean McGowan, Oxygen Thief, Johnny Lloyd, Brand New Friend, Deux Furieuses and Grace Petrie.